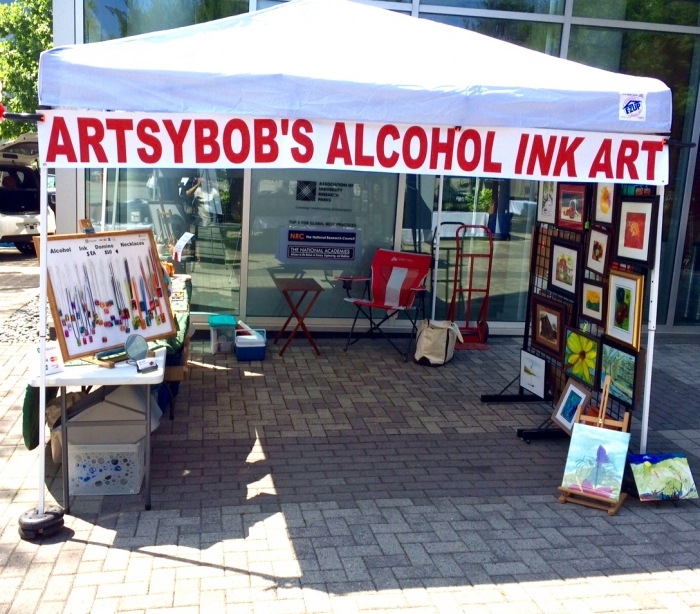 If you want to send someone to be your public face, whether at an art fair, family reunion, or tailgating, you send an envoy. When you want that public face to be something, rather than someone, that shows how practical you are - and how smart with your time and effort, you set up an Envoy. EZ-Up earns their name - again - with the Envoy 10 x 10 Straight Leg Instant Shelter - because in under a minute after you pull it out of its included 300 denier carry bag, you'll have it completely set up, ready to give you the shade you need, whether you're tailgating, setting up a booth at an art fair, or looking for some quick respite from the sun at the beach. Its 150 denier top is lightweight, but durable enough to resist 99% of harmful UV rays, while its Aluminex backing helps reflect heat away from your needed shade. Are there anchors and weights that go with this tent? Most customers use weight bags for each leg at the base, found here and/or Gravity Tubes, found here to add stability from the top. Is this a good canopy/tent for beach area? Will it withstand beach winds? This would be a great canopy for the beach but it will need to be properly anchored. The manufacturer recommends that the canopy is taken down in windy or extreme weather conditions. Does this tent meet the NFPA 701 requirements ? This does not meet the NFPA 701 requirements. Please view our Caravan Traveler 10 x 10 Canopy which does have CPAI-84 and NFPA-701 Flame Requirements. This item is located here. Can we buy sides for it? No, there are no sides available for this canopy. Is the canopy always on the frame, or do you have to remove it to put it away? The canopy is always on the frame. Is this shelter water-proof and is it really easy to set up? I'm 74 yrs old and need to set this shelter up at the Farmer's market by myself. Thank you. This canopy is not waterproof, but is one of our easiest to assemble and carry at only 29 pounds. Does this canopy have adjustable heights? This particular canopy does not have adjustable heights. Do you offer a replacement fabric top for this model? What is the size of the EZ Up Envoy EN100 tent when folded? The folded dimensions are 49.5" x 8" x 8" and the total weight in the bag is 34 pounds. What are the dimensions when packed up? The folded dimensions are 49.5 x 8 x 8 and the total weight in the bag is 34 pounds. Do you know the required height space for putting a logo on the "triangle" part of the tent? Logos must be added to the fabric before it is cut and sewn into the canopy top. Graphics can not be put on pre-existing canopies. Does the fire retardant rating comply with NFPA 701 requirements? Thank you for your inquiry. The EZ-Up EN100 Envoy 10 x 10 Straight Leg Instant Shelter does not feature the fire rating of NFPA 701. Does this model come with screen sides? This model does not have available screen sides. Does this come with walls? This canopy does not come with walls. Is this canopy waterproof and does it have the easy push buttons for extension? This does feature button sliders for easy adjustment and is water-resistant, but the only waterproof canopy we offer is the Vitabri V3 10 x 10 Aluminum Pop Up Waterproof Canopy. Are there feet on the tent legs? We are not allowed to hammer anything into the ground and will need to use a ballast system somehow. There will indeed be feet on the tent legs and most customers use weight bags for each leg at the base and/or Gravity Tubes to add stability from the top. Can you add a screen kit to this E-Z Up EN100? You certainly can! We have the E-Z UP 10 x 10 Screen Room. When closed up and in storage bag, what are the dimensions? I want to know if and how it would fit in my car. Also, the weight says 29 pounds when assembled. Is there a different weight when it is compressed in storage bag? Can you purchase sides for this particular model? We do not have sides for this model, but we do have an E-Z UP unit with sidewalls in a value package here. What is the height of the edge of the canopy to the ground? In my application I need at least a 6 1/2 foot clearance at the edges for access. The clearance for this canopy from the edge of the canopy to the ground is exactly 6 1/2 feet. Is it possible to get walls for this tent? This tent does not have available sidewalls. Does this EZ-Up EN100 stand up to strong wind? Thank you for your inquiry. The E-Z Up EN100 is a pop up canopy and is not wind rated. You would need to use your judgement when set up in windy conditions. I have several different EZ-up shelters. I always use the EZ-up sand bags and secure them to each leg and attach a ratchet strap to the top of the frame. This works for me, however I just purchased this one and have not had it out in weather as of this time. This shelter will stand up to wind. I don't know how strong you are talking about. Hurricane winds, no. Rain squall winds probably not. but I have had mine up in 15-20 MPH. Of course I have weights on each leg. 20 lbs. per leg and if the wind were stronger than that I would increase to 40 lbs. per leg. Does the EZ Up have a center truss that is used for pushing up? The EZ-Up does not have a center truss. It has a truss system extending from all four corners to the center. Do you have anchor bags for this version? I need a 10 x 10 canopy for a vendor booth but the legs have to be anchored. You can indeed pair these weight bags here with this EZ-Up model canopy. Does this EZ-Up EN100 Envoy 10 x 10 straight leg instant shelter come with a roller bag? Thank you for your inquiry. There is a storage bag that is included with the EN100 Envoy 10 x 10 Straight Leg Instant Shelter but it is not a roller bag. No, there is no roller bag. There is, however, a very well constructed bag with a sturdy zipper from one end to the other, and the bag has handles. We purchased separately a beach buggy/cart with wheels that we placed the EZ-Up Envoy bag in to get it to the beach. It's a great canopy/shelter, very well made and easy to erect and take down. Is this EZ-Up EN100 Envoy 10 x 10 straight leg instant canopy already attached to the tent frame when it's delivered? Thank you for your inquiry. The top and frame are separate, and we recommend you remove the top before you fold up to avoid the fabric getting pinched in the components of the frame. The canopy is attached to the frame at each corner. It is very easy to put up if you follow the instructions for doing so. 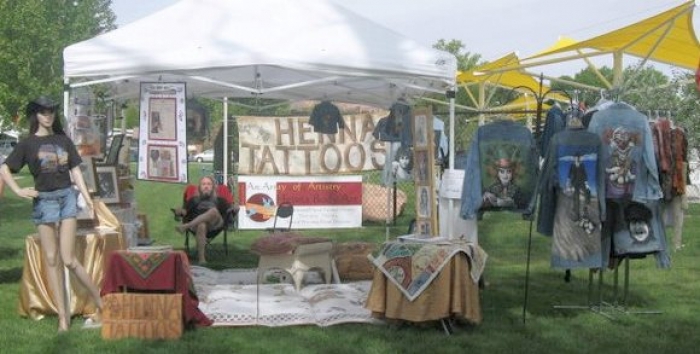 I do art festivals and I can erect the canopy without help. It is very easy. No, you have to put the top on once you spread the frame. It is usually best to take the top off before you store it. The canopy is not attached to the frame, it is separate. When folding up the frame, the canopy may either be left on or removed and replaced the next time the frame is set up. We used our 10 x 10 at the beach for three weeks, setting it up daily, and loved it! We did get leg weights to help stabilize it in very windy conditions. Can one person set this EZ-UP EN100 Envoy canopy up by themselves? Being only 29 lbs and having an easy pop-up style, one person should be able to set up this canopy with ease. 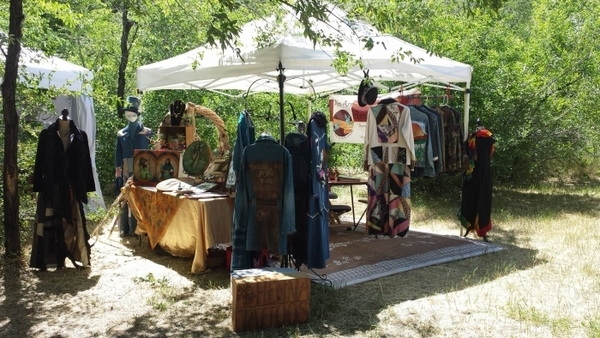 I do art and Craft festivals by myself and the ENVOY is easy for me to set up very quickly. It also collapses very quickly. This is an excellent product. Is this EZ-Up EN100 instant shelter fire retardant? The EZ-Up Envoy does, indeed, meet CPAI-84 Fire Resistant Requirements. Is the top already attached to this EZ-Up EN100 Envoy instant canopy when it is delivered? The top comes detached from the frame on this canopy. Does this EZ-Up En100 Envoy instant shelter have ropes that attach with pins to the ground? No, it has stakes that go through the feet. No, this model doesn't have ropes that attach with pins to the ground. However, the feet beneath each leg have holes in them, so that might mean one could put pins through into the ground. Hope this helps. It's a very nice unit and not difficult to put up and take down. How tall is the space inside this EZ-Up instant shelter canopy? The valance clearance is 6'-2" and the peak height of this canopy is 111" inches (9'-3") tall. Does this EZ-Up straight leg canopy come with a roller bag? No, it does not come with a roller bag. Does this canopy have leg weights available to go with it? We do have weight bags available for purchase to wrap around the legs. Honestly, I haven't opened ours because we're moving, but I don't believe that it does. I read some various suggestions, and the easiest one that I saw was to take some plastic grocery bags, double them, and add sand or dirt and then attach them to the legs tightly. I could also hang my purse from the awning framework and it would work nicely! Best of Luck! It does not but it does come with the stakes though. We just use cement blocks. There are weights available. They are canvas bags that can be filled with sand and strapped to the bottom of the of the tent legs. I use the 5 pound weights that slide onto the bottom of the legs. I also use the stakes that come with the canopy before putting the weights in place. Common sense helps a lot as well. Sometimes the wind is just too strong no matter how much weight you use. There is an Allen Wrench in the bag that you'll need so be sure to hold onto it. I love my canopy and would never consider a different brand. What are the dimensions of each triangular section of canvas? Also, what are the dimensions of each rectangular section of canvas? What is the footage of shade for this canopy? I need to verify if there is at least 10 feet of shade. This canopy provides 100 square foot of shade total, or 10 feet in each direction. This, of course, will vary depending on the angle of the sun. I had no problem with the shade issue. I work under the canopy all summer ty-dyeing clothes. I new one is easy to put up and is better made than other canopies. I had my first one for 10 years through rains, hail and snow. Good product and that's why i went back to EZ-Up products. What are the dimensions of this shelter when it is inside its bag? Also, what is the total weight? What is the size of the EZ-Up 160105 Envoy 10 x 10 tent when it is inside of the package bag? The folded dimensions for the EZ Up Envoy is 49.5 x 8 x 8. Does your canopy have the ability to be tied down? Are there loops at the corners of this for anchor lines? No, this canopy does not have the ability to be tied down from the corners. It comes with spike anchors. We would also suggest that you use Weight Bags. Does the canopy cover stay connected to the frame for pop up and take down or does it need to be placed onto the frame and removed beforehand? We recommend that set per manufacturers recommendations. The top will need to be removed when folding up and unfolding so you can avoid the material from being pinched in the joints and possibly tearing or causing a weakness in the material. Is the 160105 Envoy available in black or is there another similar 10x10 canopy in black? This item only comes in white. The closest item we have that comes with a black top is the ShelterLogic 10 x 10 Pro Series. We do have the option for a black top with all of our Caravan brand canopies. You can use the Narrow Selection option on the far left to select only the 10 x 10 options. Can I get this in a different color (Navy), a little bigger (12 X 12 or 10 X 15), and with three sides? I'm looking for something for our cross country team. This canopy comes in white only. We do carry Caravan brand canopies which you can get in 10 x 15 and in Navy Blue. There are also both 15 foot side walls and 10 foot side walls available for them. Is this canopy meant to stand up to a bit of rain? It is water resistant but not waterproof. In light showers, you should have no problem. However, in heavy rains or sustained rains, water will pool in the top of the canopy, eventually leaking and possibly causing damage to the frame. 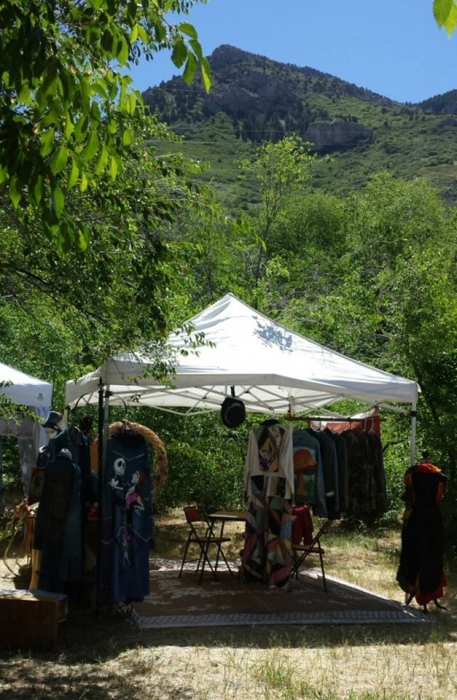 Pop-up canopies are primarily designed as shade shelters. The only actual water proof canopy we have is the Vitabri canopy. Can one short person set this up? Are sidewalks available for this mode? The assembled weight is only 29 pounds so if that is a weight you can comfortably handle then one person could set it up. We do not currently have side walls available for this. 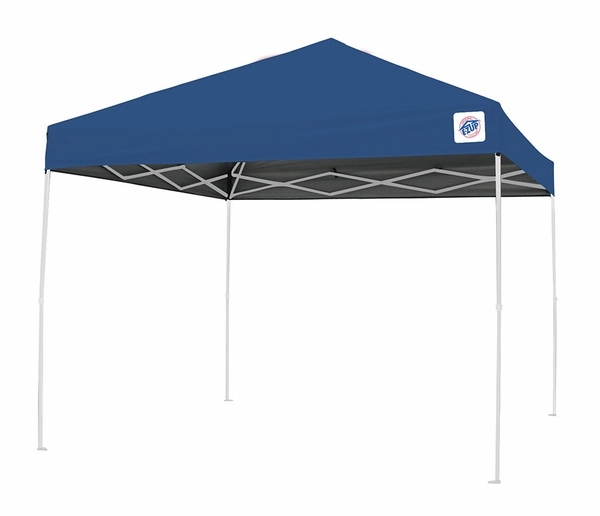 If you are interested in a light weight unit that comes with side walls, we would suggest the Undercover 10' x 10' Super Lightweight Commercial Aluminum Popup Shade Canopy Package with 4 Sidewalls. While it weighs slightly more at 36 pounds, you would have the advantage of having side walls. This is heavy to put up and carry; wheels on the bag would be helpful. The feet on the poles should be larger, so you can raise it easier. This is definitely a two person job. I needed a more lightweight tent for events that only last a few hours and where weight and portability are of value. This tent works very well for that use. It is smaller, when in its bag, than my other festival tent, taking up less space in the car. It is also more easily carried. Set-up is relatively quick, although I do require some help from others to extend it fully since it doesn't have the central pole of my other tent. But, that's okay - at large events there are always a few people around willing to help. The quality seems good - I only used it once so far. As for shelter from the rain, the first and only time I set it up, the skies opened five minutes later and a drenching rain commenced. It lasted for a full fifteen minutes and we did stay dry underneath the tent. I've been doing events for a lot of years. EZ Up canopies are sturdier, and last longer than ANYTHING else I've ever tried. We'll continue to buy their products when ever we need a new set up. I totally loved my new canopy until I tried to order sidewalls for it and have now learned there are no sides to fit the Envoy. They say it is not actually 10' x 10', but is larger; thus, no sidewalls will fit. I need my canopy for a vendor situation. I would like it to look professional now I will need to use tarps with it, which is not good for my business or for EZ-Up. Does this not make their product look good either? And when I tell other vendors, they will not buy the product either. I've only used it once. Don't buy this one. Right out of the box, up in a few minutes. Very easy!! Back down and back in the carry bag just as easily. Love it!! EASY TO SET UP....A GREAT DEAL..
Easy to assemble. I put it up with my 8 year old granddaughter. ConsWould be 5 stars if stakes were larger. This canopy goes up very easily with two people. We bought this for our craft show, and I'm glad we did. It made a rainy day a lot more manageable. This instant shelter is made of superior quality materials. My wife and I were able to set it up by ourselves, but it would have been a little easier if there had been someone helping with each corner. The silver heat blocking lining on the inside is wonderful for outdoor usage, but it would be nice if the shelter had some more hook and loop anchors around the edges to give some added support; overall, however, it has sufficient support. We encountered some moderate winds our first time out, but the corner anchors held up well. I was shocked at all the upgrades that this Envoy came with. I had one years ago and was expecting the same hard-to-install canopy. Instead, I got something that was simple to put together with two people. My only complaint is that they took off the wheels on the storage bag, which made it easy to move around. I do like the zipper on the side of the storage bag though. I like this model so much that I bought another one! I cannot say enough about how easy this is to set up. You can buy cheaper tents, but this is definitely worth the money. You have to put the other ones together. This tent just pushes up and locks. You can even put it up by yourself if you have to. Order, delivery, packaging were good. ConsOne of the corner poles was assembled 90 degrees off, so that the hole to lock the tent in place is not functional. I will probably try to fix this myself, as shipping it back seems like a bit of a hassle. ConsThe only thing is that sometimes the buttons get stuck so you have to pull the leg off and try fixing it that way. We had an ezup tent for about 7 o 8 years. It allowed us to sit on our deck all summer during the hot days. An 80 MPH wind came thru our neighborhood and destroyed the tent. We parched this tent because we had good results from the first one. We would recommend this tent so you can sit on your deck during hot weather. Very happy with our canopy!! Easy to put up the first time and nice carrying case included. Thanks. Ordered product online with no issues. Prosgreat price. Easy to assemble, packaged great. I purchased a less expensive canopy from a local store and returned it as it was inferior. This one was much more expensive and well worth it. I believe this canopy will last much longer. This is not the most expensive pop up canopy but I think for the price I paid I got a good value. It packs and unpacks really simply. Can be done by one person but take a bit longer. Two is perfect, folds up nicely easy to carry. ProsEasy set up and tear down. Folds up nicely, nice carrying bag not too heavy either. Price value is pretty good! ConsI did not order any tie downs or weights so you might have to get some or come up with a creative way of putting weight on the corners to hold down during windy days. When most people think of putting up a canopy, tent, or any other temporary shelter the first thought is typically, "this will be cumbersome, awkward, and how long is this going to take. Admittedly that's what I was thinking, but with the EZ-Up I was pleasantly surprised. It was easy to set up, and easy to take down and haul away to the next venue. Because I am constantly going from place to place with and taking it up and down I was concerned about durability, but with a frame made of steel instead of aluminum I no longer worry. I've owned seven of these types of canopies, not to mention the friends that continue to tried other products. The EZ-Up Canopy is built of thicker mil tubing, which does make it a little heavier, but I'd rather have quality that holds up verses lightweight that doesn't. If you're looking for a good quality, easy to set up Canopy, this is what you're looking for. Don't be fooled by the cheaper product, yeah they're cheaper but by the time you by your replacement, and your buddy still has his EZ-Up, do the math. My two cents. ProsThicker mil tubing, better construction. ConsWish it had the velcro Canopy straps to cinch down the tarp. Doesn't come with someone to help me set it up. It can easily be done by a single person but a second person makes it about a one minute project.